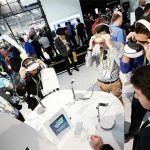 CES 2017 (Consumer Electronics Show®) marked the 50th anniversary of the premiere tech show, where over 165,000 attendees from 150 countries were able to experience firsthand the latest products and technologies from more than 3,800 exhibitors. To kick off our coverage, we’ll highlight the best innovations in MEMS and sensors, including Eureka Park, where an unprecedented 600 startups showcased early prototypes and products in various stages of development. Tucked away in the corners of the Venetian Hotel’s conference halls were some of the more interesting applications of sensor technology, all developed by ROHM and integrated into a variety of products. ROHM was able to pack a lot of tech into their space, which showed off a small sampling of the many product categories they help to power and/or improve. 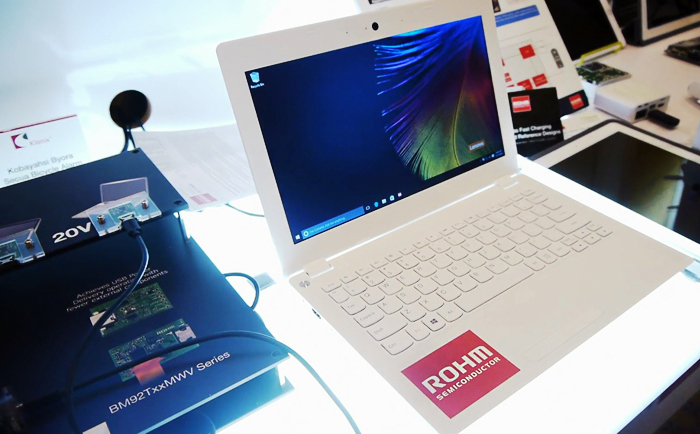 The video below provides a brief rundown of each of the products ROHM showcased at CES 2017. Figure 1. 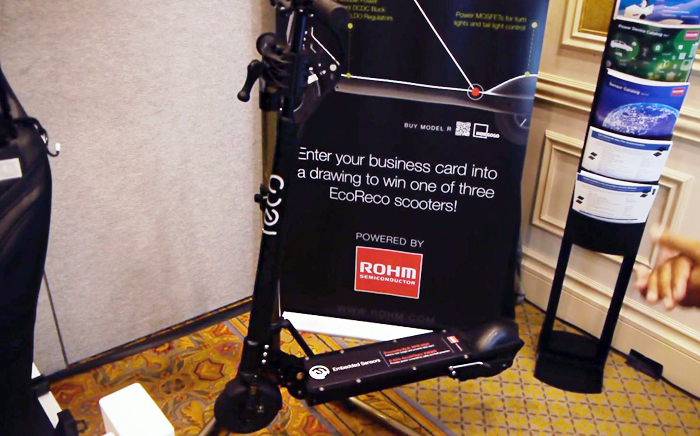 The EcoReco Model R scooter incorporates ROHM’s Proximity/ALS: RPR-0521RS and 6-Axis Accel/Gyro: KXG03. EcoReco’s Model R scooter is an electric vehicle incorporating ROHM’s smart sensors and wireless connectivity to deliver the ultimate in convenience, comfort, and fun in the personal transportation sector. EcoReco Corp, a Silicon Valley-based startup, and ROHM are collaborating to provide eco-friendly alternatives to today’s energy-depleting, environment-threatening norms. EcoReco integrates 8-bit CMOS microcontroller (ML610Q111), ROHM’s optical proximity + ambient light sensor (RPR-0521RS), EEPROMs, and Kionix’s 6-axis accel-gyro combo sensor (KXG03), along with power devices such as buck converters (BD9G341), LDOs, and power MOSFETs (2SK3065). 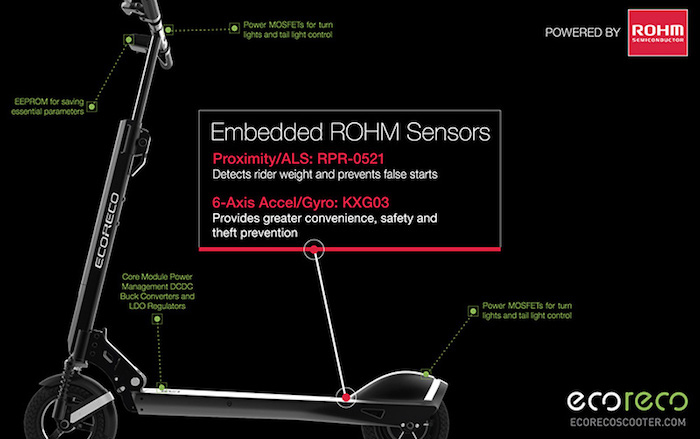 Battery power and other options on the scooter can be easily controlled via smartphone. This category of transportation is considered a “last mile” solution. Say you’ve made it close to your destination, but still need that last bit of oomph to get you to where you’re going, that’s where EcoReco comes in. It’s a great solution for those in urban environments or large campuses that often require long stretches of travel on foot. Figure 3. ROHM’s Orizuru Flying Crane Drone is powered by Lazurite Fly bringing the origami bird to life. ROHM has taken origami to the next level! Utilizing in-house components allowed ROHM to develop a paper crane that can fly like a real bird! ORIZURU was made possible using LAPIS Semiconductor’s Lazurite Fly, Lazurite Sub-GHz with high-performance, ultra-low-power 16-bit microcontroller (ML620500), ROHM’s radio module (BP3596A), barometric pressure sensor, wireless communication IC, and Kionix’s 6-axis accel-gyro combo sensor. 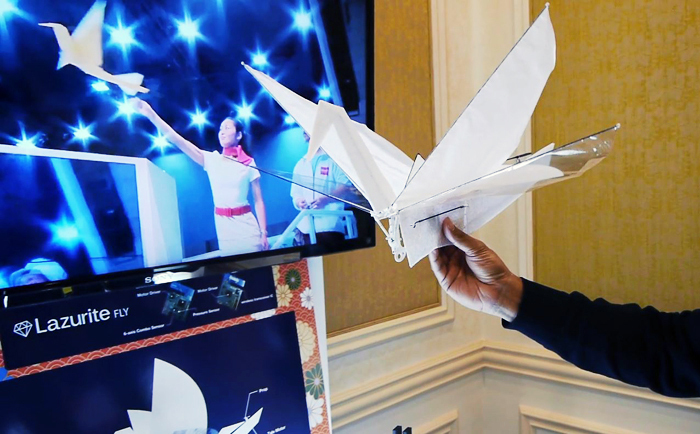 While the crane was unable to fly at CES due to restrictions, the paper crane was demonstrated in the video below where it came to life by simply flapping its wings. Read more about ORIZURU in our recent article, ORIZURU, the Origami Crane Drone! 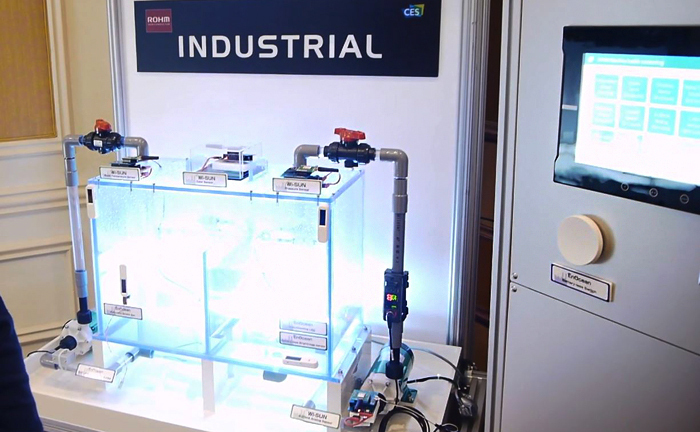 ROHM’s IoT demo for the industrial equipment sector was quite impressive as it showed how real-time monitoring of equipment can prevent accidents and failures that lead to injury and/or production stoppages. Also on display was an EnOcean Batteryless Vibration Sensor attached to a motor where it sent detected data wirelessly using vibration energy and an EnOcean Batteryless Current Sensor that detects motor current and sends the data wirelessly, all using vibration energy with no battery required. 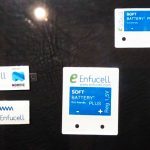 In addition, there was a Wi-SUN Water Temperature Sensor that wirelessly transmits water temperature information so that action can be taken if the water temperature falls out of a certain range. Figure 4. 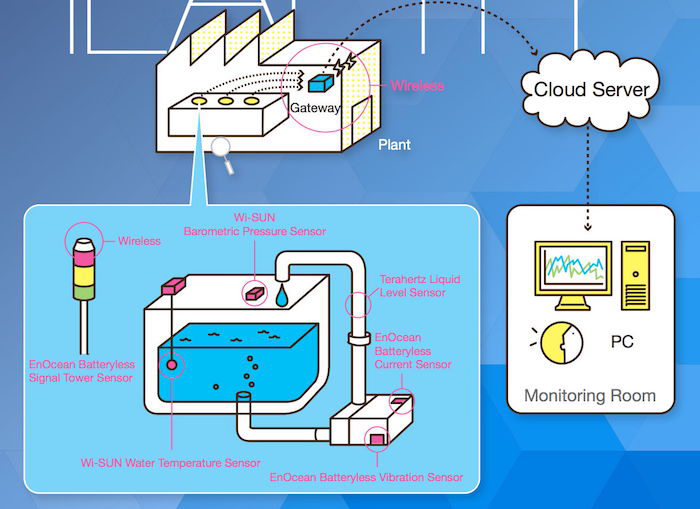 ROHM’s Machine Health Monitoring demo incorporates EnOcean’s Batteryless and Current Sensors along with Wi-SUN Pressure and Water Temperature Sensors that send data via wifi to a central gateway for monitoring. Figure 6. ROHM’s Pulse Launcher Unit (PLU) measures the user’s pulse and movement as he/she destroys objects on the screen and dodges obstacles. ROHM’s Pulse Launcher Unit (PLU) is designed to measure the user’s pulse and calculate the ability to destroy objects on the screen while also dodging obstacles by moving up, down, left, and right. The user’s movement (i.e. athletic performance) is detected by the integrated gyroscope and accelerometer. Concentration is measured in real time by the embedded pulse sensor. The scoring system (Ability Index) is determined by multiplying the concentration level by athletic performance. Figure 7. ROHM’s Formula E Inverter used in Venturi’s Formula E race car. ROHM is an Official Technology Partner of Venturi Formula E team. 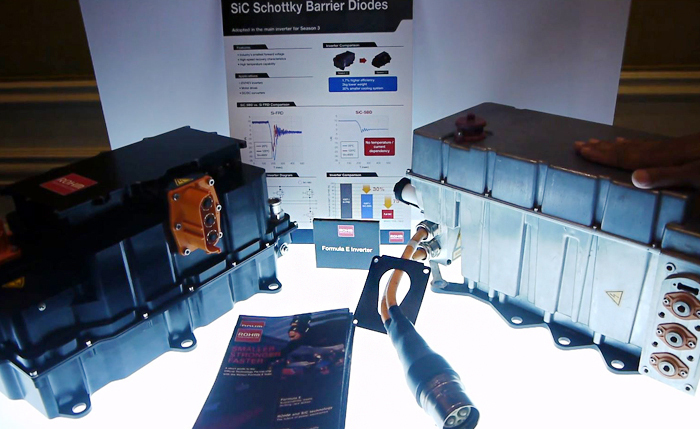 ROHM’s Silicon Carbide (SiC) Schottky Barrier Diodes are used in the primary inverter, increasing efficiency by 1.7%, while decreasing power consumption and reducing weight and volume by 2kg and 30%, respectively. SiC, which is a compound semiconductor comprised of carbon and silicon, allows devices to work at higher voltages and currents and features higher power density and lower switching losses, even under high-temperature operation. Every second and every ounce counts in Formula E racing. There is no doubt that ROHM’s SiC is built for high speed and performance. ROHM’s Automotive Infotainment demo included a combination of ROHM sensors and dashboard displays for the car of the future. Not quite as fast as Formula E, it is definitely closer to the realm of those of us who drive to work and other places day-to-day in our cars, The demo included Smart Entry operation, camera displays of driving conditions, and Adaptive Driving Beam (ADB) headlights. Smart Entry provides authentication via the user’s smartphone when entering the car. Placing the smartphone near the wireless charger automatically initiates charging and tilts the steering wheel to the preset position. The center panel displays the vehicle speed, name of the road/expressway, and proximity information of oncoming vehicles, while route navigation, rear camera view, and the pulse rate of the driver are shown on the center cluster display. In the side mirrorless monitor section, video from cameras mounted in place of the side mirrors can be viewed. All of this is made possible by ROHM’s IoT solutions for the automotive sector. Competitors in the CES 2017 Techstars Pitch Competition series in the AR, VR, and Robotics categories included FoldiMate, FotoKite, Leka, Boxfish,Birds.ai, Raccoon, Dotterel, and HoloLamp. Is there anything better than an automatic folding laundry machine?! If you dread folding your laundry or simply want the time to do more fun activities, then FoldiMate is for you. The company is still taking pre-orders and didn’t showcase a working prototype on the floor, but they generated quite a bit of buzz throughout CES. 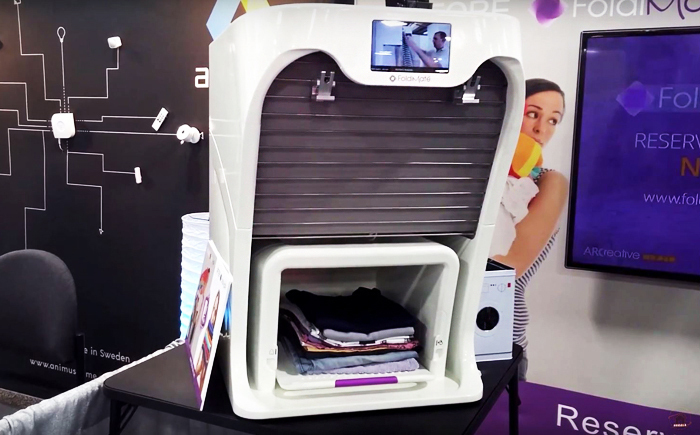 Not only will it fold your laundry, but there will be optional extras to de-wrinkle, soften, sanitize, and scent folded items. Fly a GoPro! That’s what the makers of Fotokite would likely tell you to do, as their tethered drone is like a kite for cameras. Since the drone is tethered by a string, there is no need for GPS. FotoKite is completely foldable which fits nicely into its portable case and weighs 252g (without battery and camera). 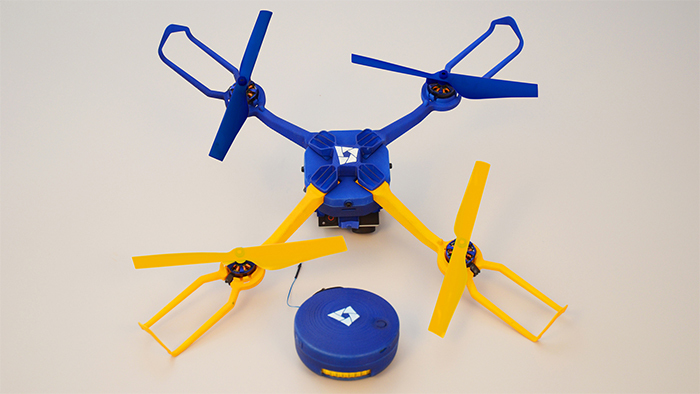 The drone uses an 11.1V/1300mAh Polymer Li-ion battery which gives it 13 min. of flight. The string ranges from 8 to 30m in length (depending on model). Simply unfold the drone and fly it to start taking pictures and video. It’s like a selfie stick on steroids. 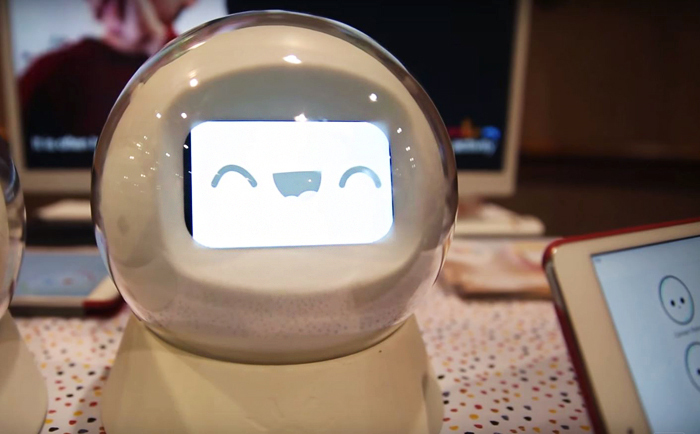 Leka is a multi-sensory robotic magical orb with lights, sounds, and vibrations designed to engage children with special needs and learning disabilities while tracking their progress. It features educational (both multiplayer and autonomous) games to help children learn motor, cognitive and emotional skills and to encourage social interactions. Leka addresses each child’s individual needs, and stimulates autonomous behavior by guiding the child to complete different daily tasks through pictograms and vocal instructions. 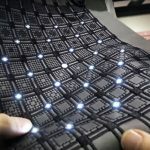 Its built-in sensors can detect and respond to facilitate interaction. Leka can be charged wirelessly and features a battery life of about 3 hours. The multi-sensory robot has been tested with over a hundred children on the autism spectrum with positive results. When you hear the term drone, you immediately think of unmanned aircraft flying overhead. 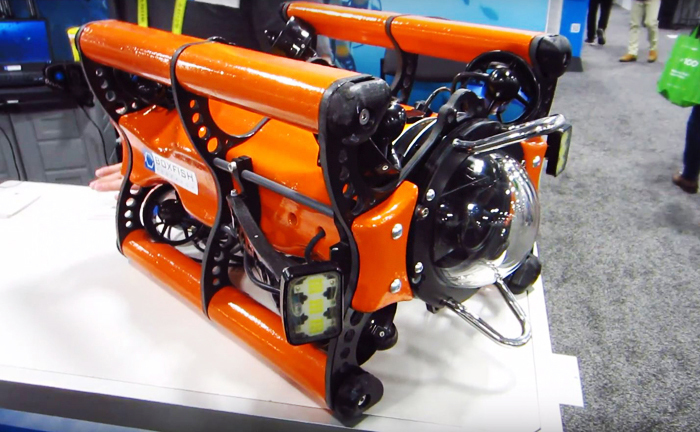 Well, Boxfish begs to differ as it is an underwater drone that goes down 3,000 feet under the sea, capturing and streaming spherical 360 video, live 4K-UHD video, and scientific data remotely from the surface. It features 6-axis stabilization that gives full control of shooting position in ultra-high definition and runs for 6 hours. It weighs around 58lb. Not only does it do all this, but the team claims their drone is typically a quarter of the price ($50,000) of competing products. Birds.ai from Dutch UAS on Vimeo. Unlike its competitors, Birds.ai is cloud-based. The company takes aerial images (often provided by drones) and gathers information for the agricultural and inspection markets. For instance, when a farm wants to know the state of its crops, a drone flies over and takes images of the farm. Birds.ai inspects those photos and provides information about the number and state of the crops. Another example is in the wind turbine market where defects are detected using aerial footage. This is normally a manual process, but Birds.ai automates it by automatically flagging the photos and areas of the photos where defects are detected, saving time and money. 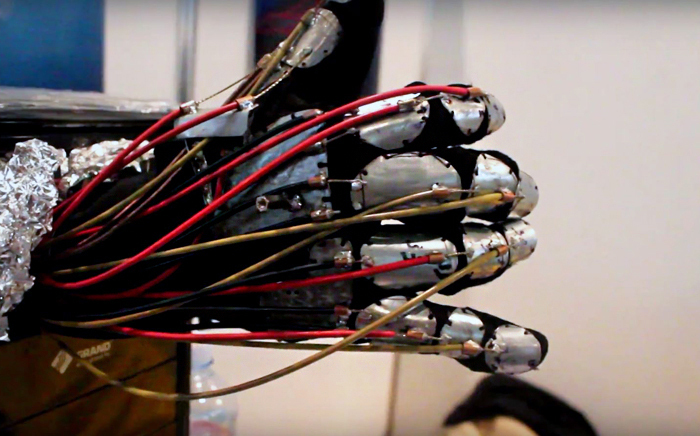 Raccoon is developing a VR glove that reproduces fine motor skills and tactile perception. 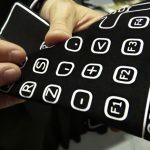 Designed by Ukrainian developers, the glove allows users to interact with the virtual world and experience it as real. 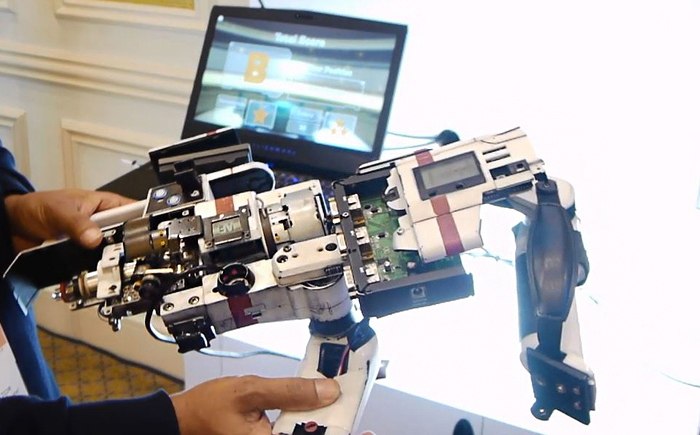 It’s an ongoing project, but the current prototype is equipped to enable free movement, with multiple sensors capable of picking up the smallest movements of the joints and the position of the hand in the space. The data is processed and transmitted to the playback device (e.g. physical VR) which is then played on a monitor or VR headset. Drones are cool but rarely quiet. 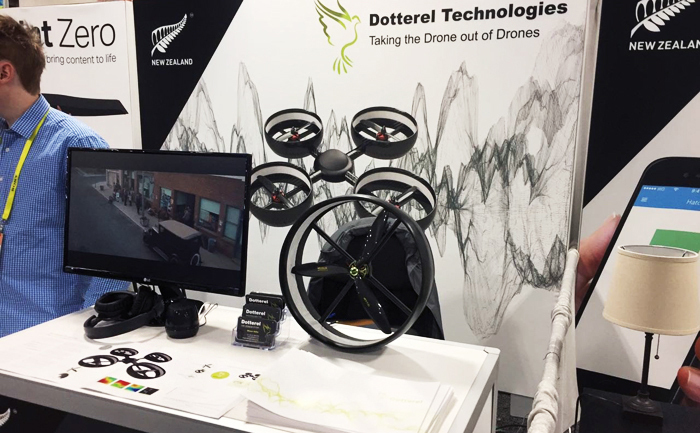 Dotterel is all about making drones quieter and allowing them to capture sounds directly in addition to images and videos. They’ve developed a unique method to lessen the noise of drones by surrounding the propellers with nano-fibre acoustic dampening materials. This technology is referred as “shrouding” and not only reduces noise pollution but provides additional safety measures, such as protection for the UAV. Remember the “holochess” game from Star Wars? 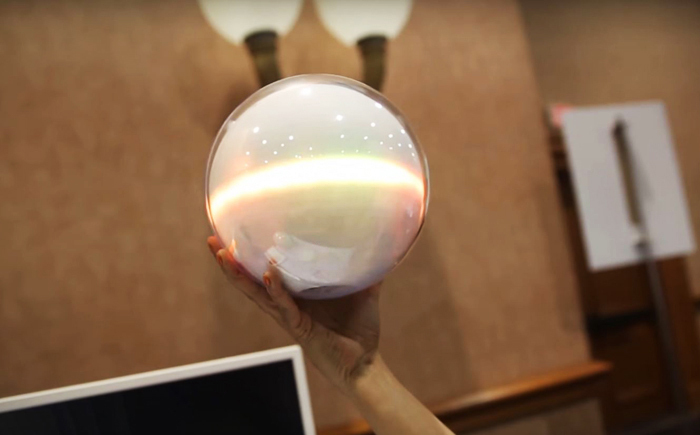 HoloLamp is bringing similar technology from a galaxy far, far away to us now! 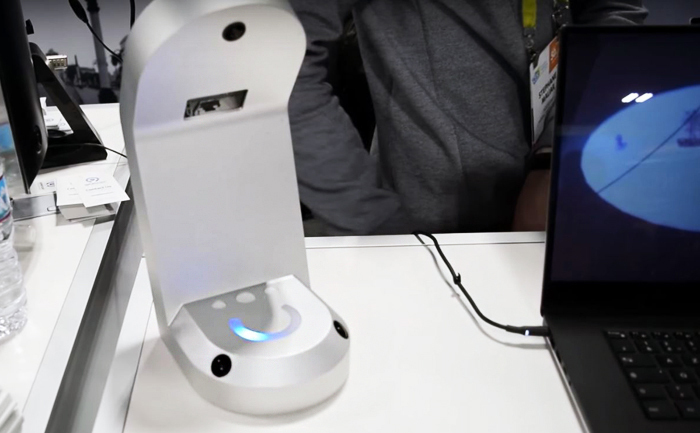 It’s a desktop spatial augmented reality projector that connects to a computer and creates 3D images using an optical effect based on projection and eye tracking, without having to hold or wear special equipment. The company is launching a crowdfunding campaign soon and the lamp unit will come with Unity SDK and an animated chess game. HDMI output and USB port are needed to use the unit. 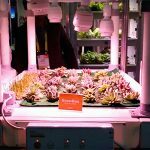 Between ROHM’s CES 2017 booth and the Techstars pitch competition at CES 2017, there was no shortage of high-tech demos of sensors, drones, robotics, augmented reality, and virtual reality products. ROHM’s booth showcased the many different applications of sensor technologies that ROHM and others are implementing to make products better and smarter, while the Techstars Competition highlighted some of the best products from Eureka Park, which is reserved for startups and smaller tech companies. 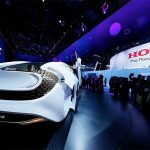 Future CES 2017 coverage will include robotics, autonomous cars, smart home tech, CES 2017 Innovation Award nominees and winners, as well as the latest in VR, AR, and drones.